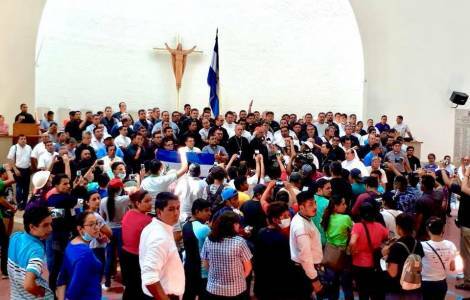 AMERICA/NICARAGUA - US Commission for religious freedom: "The Church in Nicaragua must be protected, not aggressively attacked"
Managua (Agenzia Fides) - The head of the United States Commission on International Religious Freedom, Samuel D. Brownback, said that "the situation of the Catholic clergy in Nicaragua is not acceptable" and believes that "the Church must be protected, not aggressively attacked". Brownback made these statements yesterday at a press conference, during which he talked about the situation of religion in Nicaragua, Cuba and Venezuela. Brownback explained that a member of his team recently visited Nicaragua and was able to see for himself the "bullet holes" in the walls of churches attacked during clashes between supporters of Nicaraguan President Daniel Ortega, and those demanding his resignation (see Fides, 10/09/2018). "This is not an acceptable situation for religious freedom or religious tolerance. There seem to be people, a number of individuals, who shoot at churches, persecuting the Church", Brownback said. "We do not agree with this behaviour, the Church should be protected, not a target for shooting", he added. Over the past two days, Mgr. Silvio José Baez, Auxiliary Bishop of Managua, received threats and verbal aggression. Elements close to the government have criticized the closeness of the Bishop to the people and to the weakest. Tension between youth groups and the government has increased even more. Yesterday Cardinal Brenes, Archbishop of Managua himself issued a statement to support the person and the work of Bishop Baez.